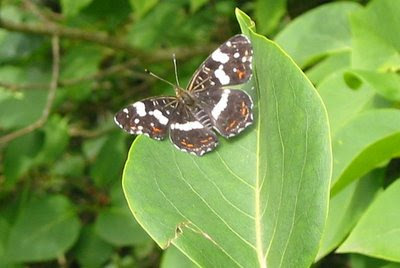 This pretty little thing is the summer form of the Map butterfly. This has two broods a year like many butterflies but unusually the two generations are different. You can see the spring form here in Paul's flickr stream. I'd never seen this butterfly before we started living here and I'm not sure if it ever visits the UK. 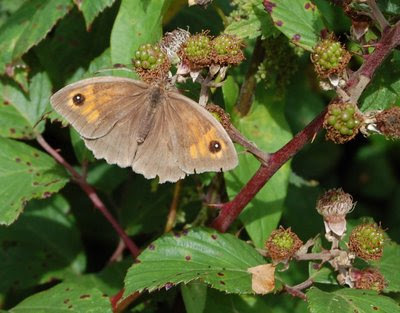 The Meadow Brown isn't a very spectacular butterfly but there are loads of them and they're very shy about having their pictures taken. Luckily the taste of the bramble flowers was sufficiently enticing to keep it still while I caught the picture, probably the best I've ever managed of one. 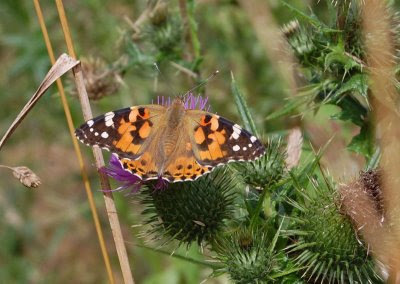 It's a bumper year for Painted Ladies, the first ones blew in with the spring storms and they are now abundant everywhere. Which is nice. If you want to see a close up of the body look here. It's a huge picture which might be slow to download if your link isn't good. The Small White is just as pernicious as the Large 'Cabbage' White but I'm pleased to see a few nonetheless. This is a female one, she's got two spots on her forewings. There was a Large White flitting around as well but it wouldn't stop still long enough for me to get the picture. 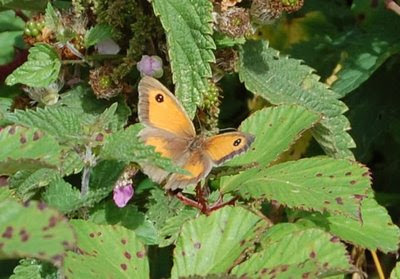 The Gatekeeper is another shy butterfly that I'm rarely successful in snapping. We have lots of these too as the caterpillars feed on grasses. 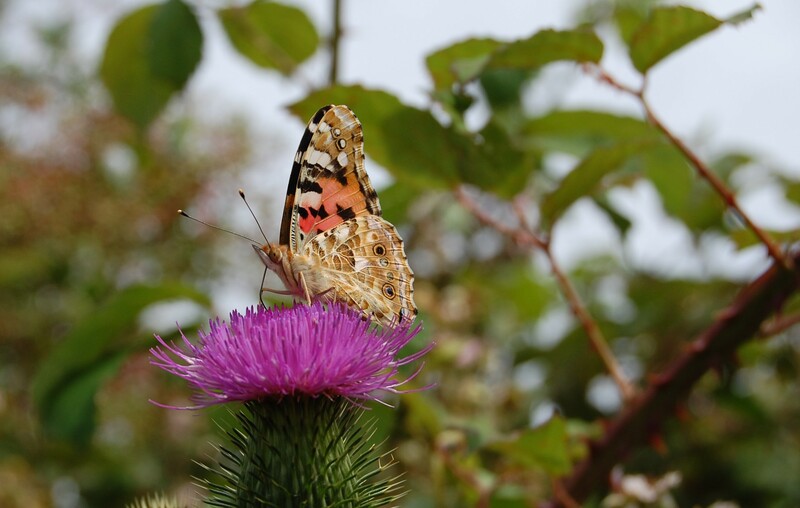 Today I also saw a battered Red Admiral and one solitary Peacock, normally perfectly commonplace around here. I don't think we've seen a small Tortoiseshell all year. 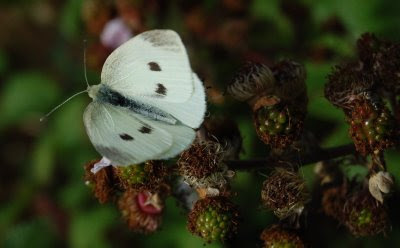 But we have seen, we think, a White Admiral (the one that got away of course), Commas, Fritillaries of various sorts and some of those small blue butterflies that are so very quick flying and so very difficult to identify because of it. In the spring we also had Orange Tips and Brimstones but the season for those is past now. I'm so glad to happen across your blog because I learned about seed swaps. BTW, I love all the photos. Thank you for posting!